MXL Timing Belts. 0.080" Pitch Trapezoidal Tooth Gear belts. MXL Timing Belts. Trapezoidal Tooth Gear belts. MXL Timing belts have very fine teeth and are generally found in equipment such as vending machines, robotic equipment, computer printers, recording/playback devices, and other consumer electronics where small timing belts are required. "Trapezoidal" is used to describe the squared shape of the tooth profiles. 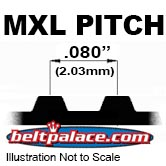 Unlike the larger pitch sizes, these MXL belts are sized by Tooth Count, Pitch Type, and Width. For example, a 52 tooth "MXL" belt 3.2mm wide would be described "52MXL3.2" in Metric or "52MXL012" in Standard or Imperial units (-"012" would represent 0.012" or 1/8"). A "G" suffix is used to further identify Neoprene belts (black rubber) and "U" is used for Polyurethane material (colored plastic). "UG" designates Polyurethane with Fiberglas cord backing. ALL BELTS ARE METRIC SIZED, NEOPRENE CONSTRUCTION UNLESS NOTED. 95MXL3.2G HTD Timing Belt. 7.6” Length, 95 teeth, 1/8” Wide. Neoprene HTD 95MXL012 Timing belt 95MXL-3.2G. Industrial Grade. 110MXL3.2G Timing belt. Industrial Grade 110MXL012. 110MXL3.2G HTD Timing Belt. 8.8” Length, 110 teeth, 1/8” Wide. Neoprene GATES 110MXL012 REPLACEMENT Timing belt 110MXL-3.2G. Industrial Grade. 110MXL6.4G HTD Timing Belt. 8.8” Length, 110 teeth, 1/4” Wide. Neoprene GATES REPLACEMENT 88MXL025 Timing belt 110MXL-6.4G. Industrial Grade. 114MXL6.4 Metric Timing belt. Industrial Grade Standard 91MXL025. 114MXL6.4-G HTD Metric Timing Belt. 9.12” Length, 114 teeth, 1/4” Wide. Neoprene GATES 91MXL025 REPLACEMENT Timing belt 114MXL-6.4G. Industrial Grade. BANDO 119MXL4.8G Metric Timing belt. SAE 95MXL019. 119MXL4.8G HTD Metric Timing Belt. 9.52” Length, 119 teeth, 3/16” Wide. Neoprene GATES 95MXL019 REPLACEMENT Timing belt 119MXL-4.8G. Industrial Grade. 120MXL3.2G Metric Timing belt. SAE 96MXL012. 120MXL3.2G Metric Timing Belt. 9.6” Length, 120 teeth, 1/8” Wide. Industrial Grade Neoprene. GATES (SAE Size) 96MXL012 REPLACEMENT Timing belt 120MXL-3.2G. 120MXL6.4G Metric Timing belt. SAE 96MXL025. 120MXL6.4G Metric Timing Belt. 9.6” Length, 120 teeth, 1/4” Wide. Industrial Grade Neoprene. GATES (SAE Size) 96MXL025 REPLACEMENT Timing belt 120MXL-6.4G. 140MXL3.2G Bando Timing Belt. 11.2” Length, 175 teeth, 1/8” Wide. Neoprene HTD 140MXL012 Timing belt, 140MXL-3.2G Industrial Grade. 162MXL4.8G Timing belt. Industrial Grade 162MXL019. 162MXL4.8G HTD Timing Belt. 12.96” Length, 162 teeth, 3/16” Wide. Neoprene HTD 162MXL019 Timing belt 162MXL-4.8G. Industrial Grade. 162MXL6.4G Timing belt. Industrial Grade 130MXL025. 162MXL6.4G HTD Timing Belt. 13.0” Length, 162 teeth, 1/4” Wide. Neoprene GATES 162MXL025 REPLACEMENT Timing belt 162MXL-6.4G. Industrial Grade. 295MXL6.4G Timing belt. Industrial Grade 295MXL025. 295MXL6.4G HTD Timing Belt. 23.6” Length, 295 teeth, 1/4” Wide. Neoprene HTD 295MXL025 Timing belt 295MXL-6.4G. Industrial Grade.